SRAM's excellent quality PC-1071 chain offers excellent durability and performance at a lower weight. Updated design uses slightly re-shaped outer plates for quieter performance. Hollow pins with nickel plated outer plates and gray inner plates. Includes PowerLock™ connector link for hassle-free installation and removal. Compatible with SRAM/Shimano 10-speed systems. 114 links. 259g. SRAM advises replacing the PowerLock connector each time the chain is broken and reattached. 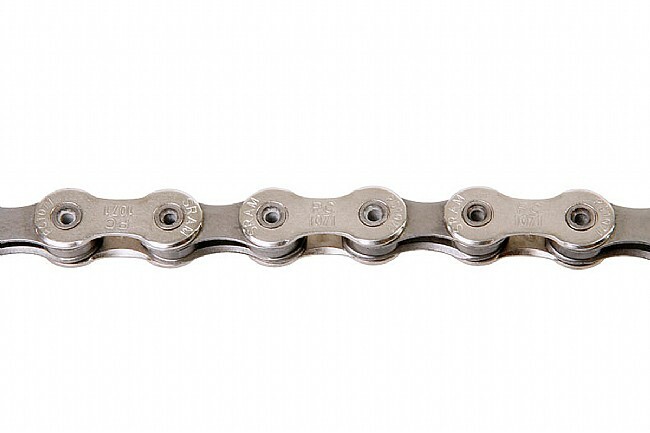 The SRAM PC-1071 10-Speed Chain is a durable chain. The SRAM PC-1071 10-Speed Chain last longer for then most chains in this price range. Needed to replace chain and link. It works perfectly. Not a ton to write about for a chain but its strong and does the job. Could be lighter but for the price its OK. The PC 1071 is reliable, economical and easy to install. I typically get about 2000 miles out of them before a chain fails the stretch measurement test. Maintenance is important though-you need to clean and lube any chain regularly. Also, I run SRAM drivetrains so the 1071 is designed to run well with the other parts. I have no experience using these with Shimano drivetrains, and can't comment on interoperability. Mated this SRAM PC-1071 10-Speed Chain and SRAM PG-1070 10-Speed Cassette with my 4 year old Shimano series 6600 drive train (SG-X 53B and 39-B, RD-6600, FD-6600, Ultrgra shifters) with no issues what so ever Easy adjustment, clean shifting, more even and better steps between gear shifts. I replaced a Shimano SG-6600 1225 cassette with the SRAM 1128. This gave me notably faster flat speed and easier pedaling on the hills. The chain quick connect link is noted by SRAM to be a onetime use item. It was difficult to engage, but seems to hold well. No issues after a few hundred miles.